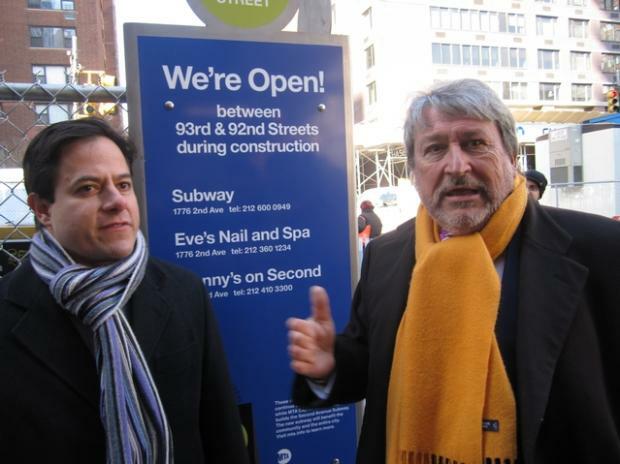 UPPER EAST SIDE — With 30 businesses already wiped out along the path of Second Avenue subway construction, the MTA unveiled its improved efforts to be "a good neighbor" to the 370 remaining shops with the launch of a new marketing campaign Friday. "We're going to blitz the neighborhood so people will understand how important it is to shop Second Avenue," President of MTA Capital Construction Michael Horodniceanu said. Beginning in April, the MTA will stock 2 million MetroCards promoting "Shop Second Avenue" in machines along Lexington Avenue stations from East 51st to East 103 streets. Advertisements will run on the area's buses and in subway stations. To make the shopping experience more appealing, Horodniceanu showed off the $150,000 worth of changes it made to its "model block" between East 92nd and East 93rd streets, where a new fence has been installed to expand the 7-foot sidewalk by 2 feet, clearer shop signage has been created and barriers for crossing the avenue will guide pedestrians through traffic. Businesses have been clamoring for help ever since construction began in 2007, but Horodniceanu hadn't realized "this is something that requires a special effort" until last summer, he said. The agency hadn't dealt with such a long-term project before, he explained of the Second Avenue subway contruction site, which stretches from East 99th to East 63rd streets. "Sometimes it requires a little more to amass enough movement toward something to make people pause, stop and think," Horodniceanu said. The MTA teamed up with the Manhattan Chamber of Commerce on the campaign, which will be using social media, such as Facebook, Foursquare, Groupon and Twitter to promote the shops in the affected area. "They're putting smart marketing minds to work," said Barry Schneider, who co-chairs Community Board 8's Second Avenue Subway task force. "It's been needed to give a positive face to Second Avenue merchants." Elected officials have been trying to find ways to help struggling businesses. State Assemblyman Jonathan Bing, for example, unsuccessfully introduced legislation to create a no-sales tax zone along Second Avenue. The vacancies have helped some new businesses like Style-Licious, a store for teens and 'tweens that Norma Hafif opened on Second Avenue and East 74th Street in October. The rent was half of what it would have been on Third Avenue, the first-time shopkeeper said. "We're a destination store with word-of-mouth, so the scaffolding hasn't been a problem," said Hafif, whose store hosts birthday parties and crafting sessions. But Joe Pecora, who's been running Delizia Pizza on Second Avenue and East 92nd Street for 25 years, said business is down 15 percent and foot traffic dipped 50 percent. "This is great," Pecora said of the new campaign. "I wish it had been sooner but better late than never." He is already focusing on the likelihood that rents wil increase once the subway is completed. The first phase is expected to be done in December 2016. "Now we need to be proactive" about lease extensions and making sure businesses putting up with the construction will be able to remain, he said. "The merchants need to see the light at the end of the tunnel when this is done."